The oceans of Maraqua are a dangerous place, and some little Maraquan petpets have gotten lost! Guide them home to their worried owners using the currents generated by some of the many whirlpools that lurk in this deep dark ocean. 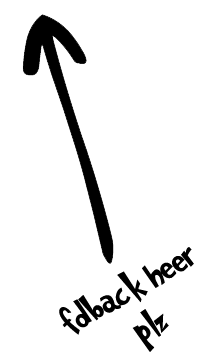 The controls for this game are very simple - you just use your mouse to click on a whirlpool, and then you can drag it wherever you want it to go. Of course, its never quite that straight-forward! Not all whirlpools are moveable - any one with a black circle behind it is permanent and thus can't be moved. You'll also notice that the whirlpools come in two different colours. Blue whirlpools create anti-clockwise currents, while the green ones move clockwise. 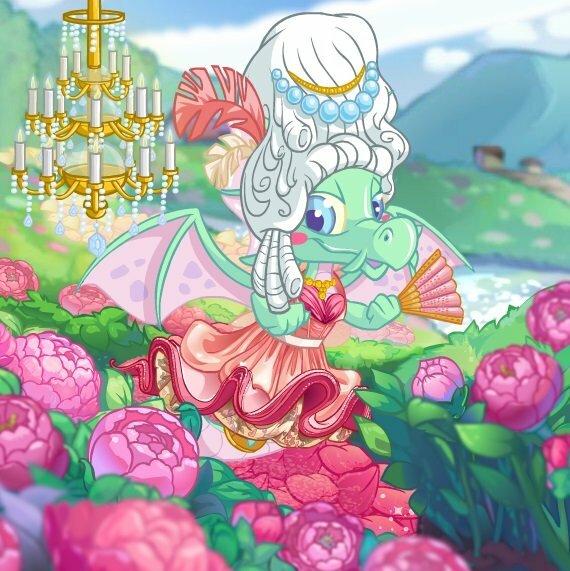 The aim of the game is to get all the petpets back to their home. 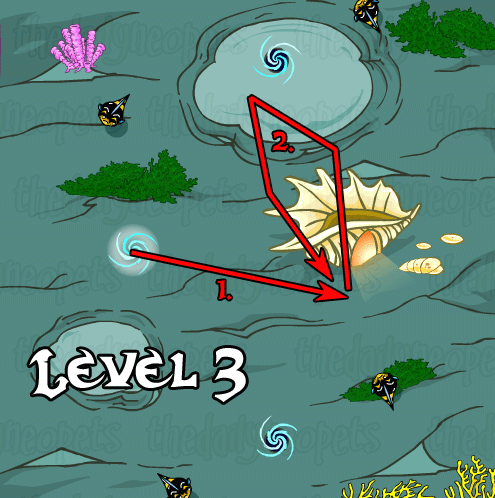 The petpets' home is the large shell, and you need to guide the little critters over the door before they'll enter. You'll also find red sea anemones lurking in the waters of Maraqua - keep the petpets away from these or they will be eaten! Anemones first start appearing in level ten. If a petpet gets eaten then your level percentage will be decreased. Finally, the last thing that you will want to think about is the time bonus. This begins at 5,000 points for each level and quickly decreases until all the petpets are either safe or have been eaten by anemones. Obviously, the quicker you are the higher your bonus will be :) On the post-level screen, the bonus is multiplied by your level percentage - therefore if you lose a petpet to the anemones then you lose part of your bonus! 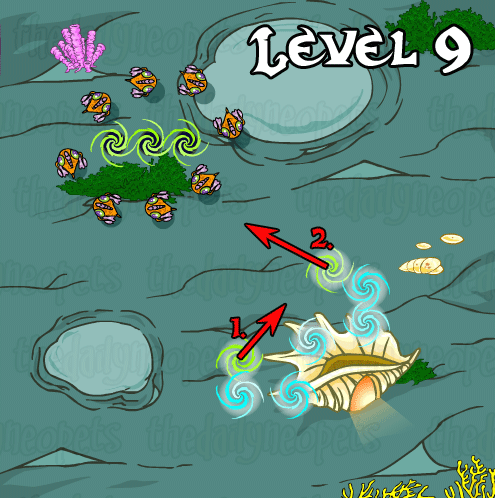 A nice easy one to start with - simply move the only whirlpool to between the shadow of the two shell spikes. Depending on how quick you are, you might have to adjust the whirlpool a little so that the petpet goes through the door. 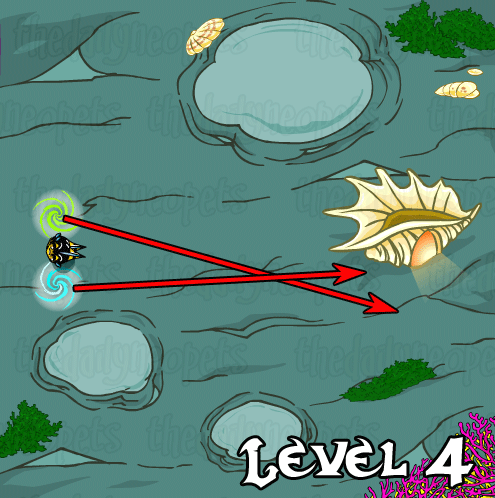 Just move whirlpools as per the arrows in the image. Again, you might need to adjust a little depending on your speed! This one is almost exactly the same as level 2. 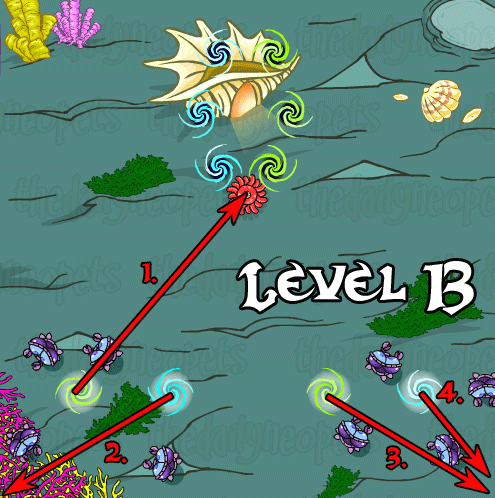 First move the middle whirlpool to the same spot as you did in level 2, then wait for the bottom four petpets to enter the shell. Once they're all in, drag the middle whirlpool up to pick up the last petpet and bring him down to the shell. 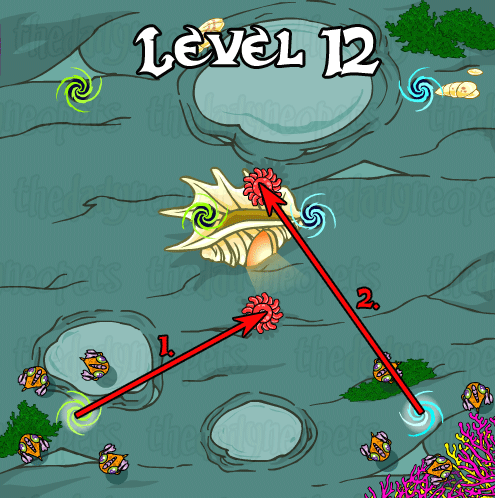 The green whirlpool is first introduced in this level - just move the two as shown in the screenie and the petpet will follow. Now we're starting to get a little complicated! 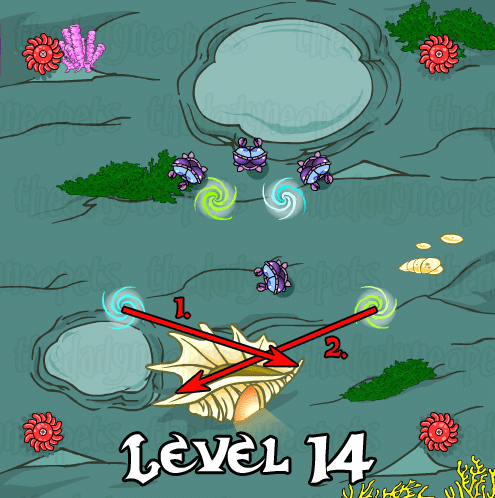 Move the whirlpools to the positions shown in the screenies - most of the petpets should go into the shell. For those that don't just adjust the whirlpools a bit until you catch them. The more you do this, the better (and faster) you'll get at it so don't worry if your bonus is a little low at first. 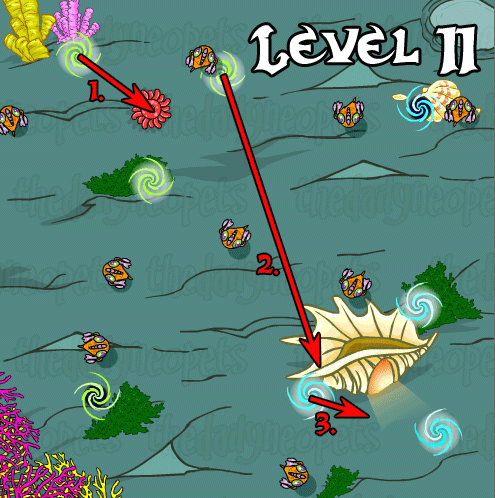 For this level to work easily, you have to move really quickly at the beginning and move the two whirlpools as shown. 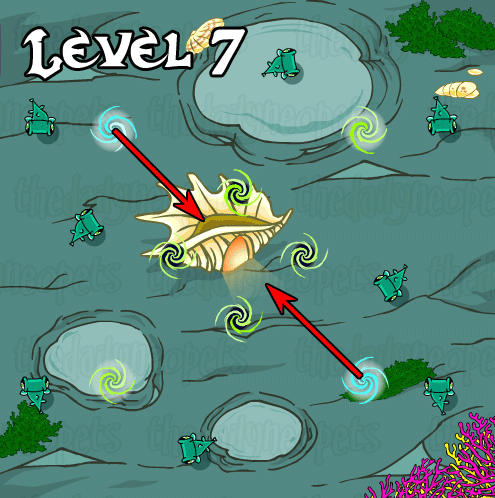 If you're a bit slow it just means that one or two of your petpets will get stuck moving around the whirlpools at the top - use one of your spare moveable whirlpools to collect them and bring them down to the shell. 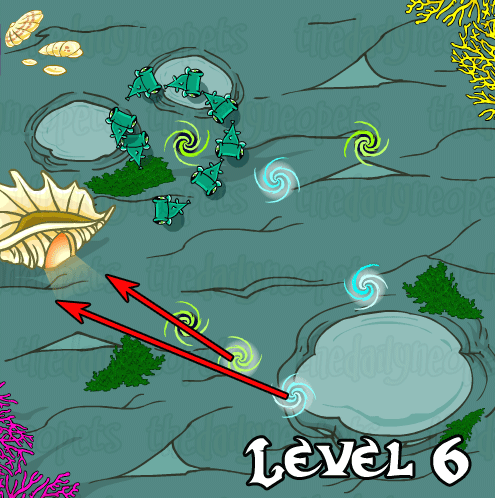 This level is ridiculously easy - just move the two blue whirlpools down between the fixed green ones and wait while all your petpets enter the shell! You have to move pretty quickly in this one, move the whirlpools as shown on the screenie. 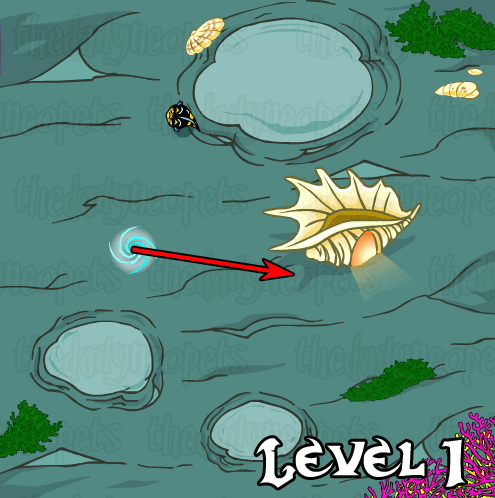 If the petpets don't go into the shell at first, keep adjusting your whirlpools until they do. This level is very fussy about putting the whirlpools into the exact right spot... its another one of those "with practise" things. 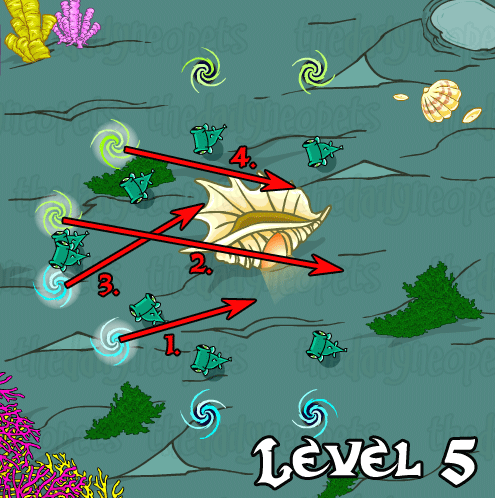 Move the two green whirlpools as shown - the petpets should follow them down and then switch direction to move neatly into the shell. If they don't switch to the blue whirlpools after coming around the bottom green one, try adjusting that bottom green one until they do. 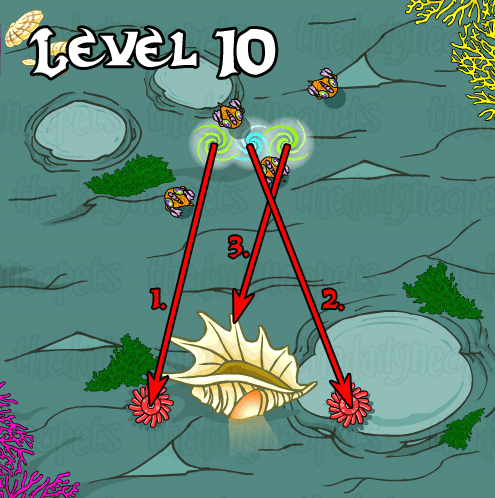 The red anemones are introduced in the level. Luckily, you can simply move your moveable whirlpools over them to keep your petpets away. 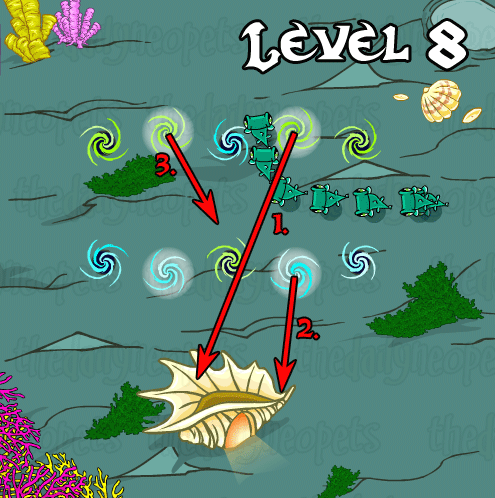 Place the last green whirlpool on the third spike of the shell and your petpets should enter the shell nicely. This is probably the most annoying level. To start with, move the green whirlpool in the top left corner over the anemone so your petpets won't get eaten. After that... well, there isn't really a set path you can create. I have put in the two moves that I usually make next, but there are almost always petpets still circling the fixed whirlpools. Use one of your spare moveable whirlpools to collect them and bring them to the shell. 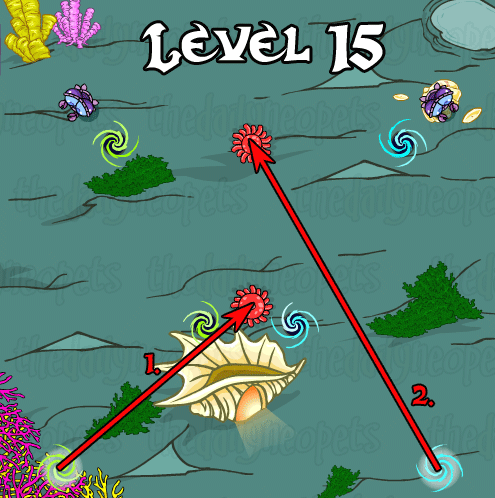 A nice easy one to follow the last level - move your two whirlpools over the anemones and your petpets will follow into the shell. Another simple one :) Move the first green whirlpool onto the anemone, and then pull the remaining three whirlpools into the bottom corners so your petpets will head up to the shell. Simply follow the screenie for this one, you may have to adjust a bit - usually the first two petpets go in fine, but the other two require you to move the whirlpools a little. 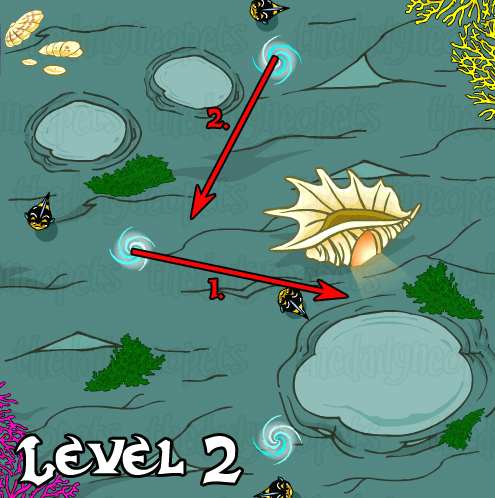 An ridiculously simple level to finish, move the two whirlpools over the anemones as you did in level 12 and the petpets should get into the shell fine. If one doesn't, wait until it is under the blue moveable whirlpool and then pull that whirlpool down towards the shell. This game has a couple of tough points, but overall its nothing too tricky - a great game for earning a solid 3k a day from! And you never know, with a big of speed and practise you might just be admiring a shiny new addition to your trophy cabinet ;) Good luck!